Calling this a “recipe” might be a little… generous. It takes approximately 5 minutes to make, there are exactly four ingredients, and you have likely made the original version more than once in your lifetime. But, all that said, it is totally worth sharing. I made these treats on Monday night, and I cannot. stop. eating them! They are chewy and crunchy and sweet and salty and just a little bit nutty – in short, they are heavenly. Rice krispie treats have always been a favorite of mine, but the addition of browned butter and a bit of salt just puts them right over the edge. 1.) In a large (5qt or larger), heavy pot, over medium heat, start by browning your butter. 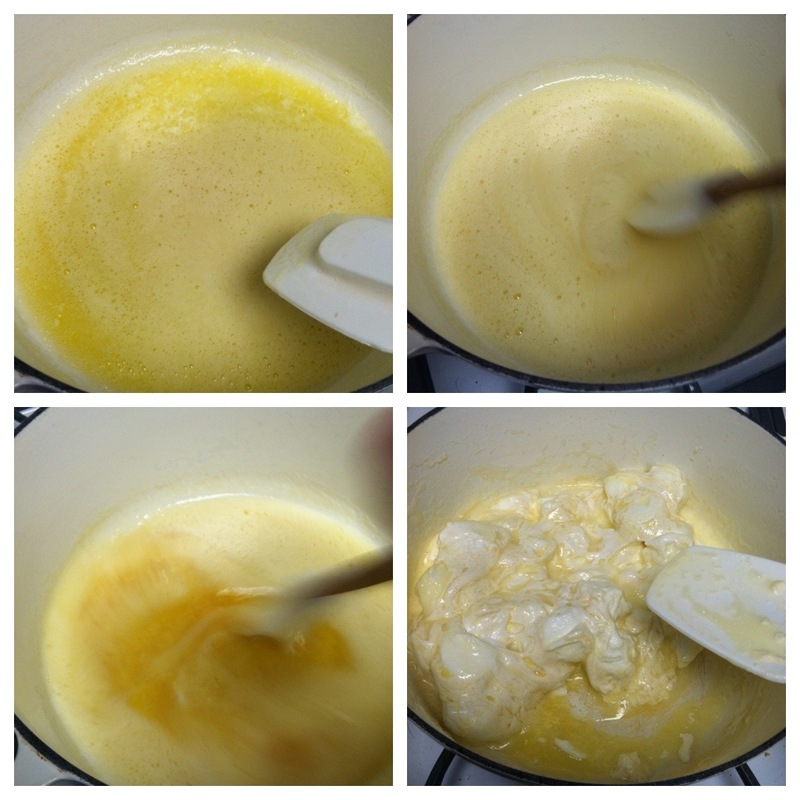 As it cooks, it will start out a clear, golden yellow, then foam a bit, and then slowly start to darken. Stir the butter frequently, and keep a close eye on it – as soon as it turns from a dark, golden yellow to brown (you’ll also be able to smell it turning a bit nutty), you want to turn off the heat. 2.) As soon as you turn off the heat, add the salt to the butter, and pour your marshmallows into the pot. Stir the marshmallows around in the browned butter so that they’re all coated (I like to use a silicone spatula). Keep stirring as they melt… it will take a few minutes, and the mixture will likely look a bit curdled, but it will come together and smooth out. 3.) Once the marshmallows are melted, pour the rice krispies in. Working quickly, stir the cereal and the marshmallow mixture together, until all the rice krispies are evenly coated. 4.) Pour the mixture into an 8″ x 8″ pan that has either been buttered or coated with cooking spray. Do your best to spread it out evenly (the silicone spatula seems to work well for it, as the marshmallows won’t stick to it). Let the treats cool completely, then cut into squares and serve. Please excuse the crappy photo - I was SUPER busy stuffing my face. You understand. Let me just say that I am working my way through the pan of these treats at a rather rapid and alarming rate. I keep going back for “just one more tiny piece”… which means that by the end of the evening, I’ve consumed a rice krispie BRICK. I am not ashamed. 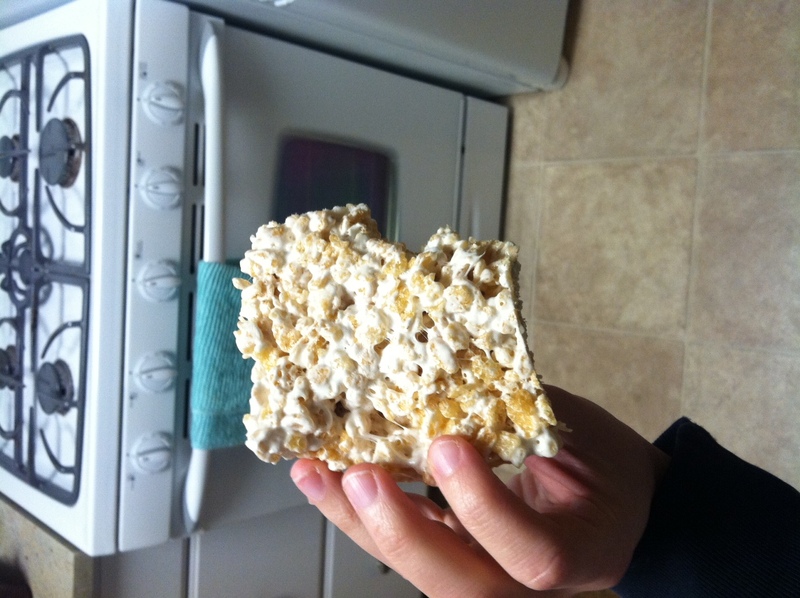 I’ve never made rice krispy treats.